Most web browsers have started to implement Do Not Track (DNT) technology which intends to allow users to opt out of third-party web tracking including tracking of information for behavioral advertising. Currently, if available, users can only opt-out of tracking by third-party trackers such as web analytic services and advertising networks by setting an opt-out cookie, and the cookie cannot be deleted or else the tracking will start again. Do Not Track adds a “Do Not Track” request to the HTTP header sent by browser to web server that serves the third-party contents to let it knows about the user wishes to not be tracked privacy preference, and instruct the site not to plant any trackers which normally in the kind of tracking cookies on the browser. And mostly important, end-users just need to configure or enable Do Not Track setting once to opt out of all web tracking. Unlike Tracking Protection List on IE9, Do Not Track signal does not have any list or registry to maintain or update. 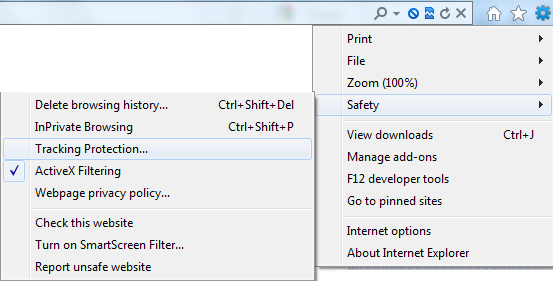 Click on the Tools (Gear) button or press Alt-X in IE9. Go to Safety in the pull down menu. Select Tracking Protection in the sub-menu, which will open “Manage Add-ons” dialog box directly on Tracking Protection add-on type. Click on Your Personalized List. Click on Enable button in the lower-right corner of the “Manage Add-ons” dialog box to turn on Do Not Track feature. Once enabled, IE will also start to automatically generate a list of blocked third-party operators in the Personalized Tracking Protection List based on third-party contents hosted on the sites you visit. IE9 monitors if a third party is delivering content to more than a few websites, which indicates it may tracking the web users. As a result, the third party will be added to the block list. Thus, the “Do Not Track” in IE9 does more than simply sending the DNT header to the third-party websites, in that any sites been added to the list will not be “called” at all, which means IE will not send any HTTP requests to the blocked third-party websites, instead of just not allowing them to install trackers locally. In other words, Tracking Protection List is a blunt tool similar to popular Adblock Plus as it not only blocks trackers, but also blocks third-party content serving. Whether a website follows the Do Not Track header is entirely voluntary, at least for now before government legislation been enforced. It’s also possible to add and subscribe to pre-compiled Tracking Protection Lists made by various privacy rights organizations. 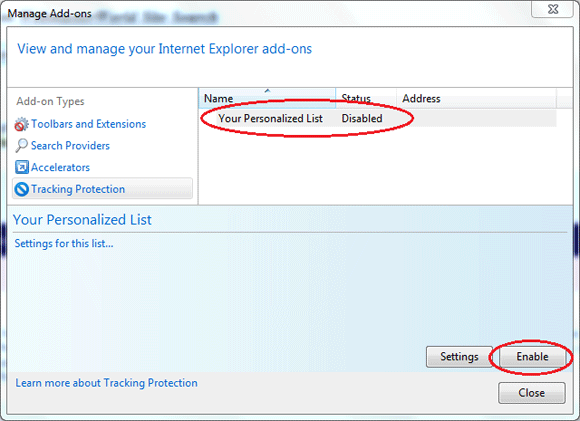 With any Tracking Protection List active, IE will send Do Not Track header automatically too.